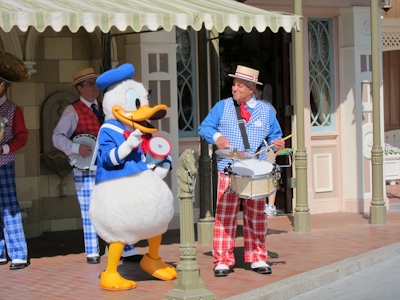 Honestly, it wasn’t until I started doing this blog that I realized how much entertainment Disneyland has. I’ve really just gone from attraction to attraction and maybe done a little people-watching, but I’ve never stopped to listed to any of the roving performers. I’m so happy to rectify it now. Theo and I were walking out of the park one day when I saw this small band of musicians over by Mr. Lincoln, so of course we pulled over to watch. Because when I say “walking” I really mean that I was walking and Theo was in the stroller. If he were walking it would take approximately 423,345,753 hours to get out of the park. He’s easily distracted. 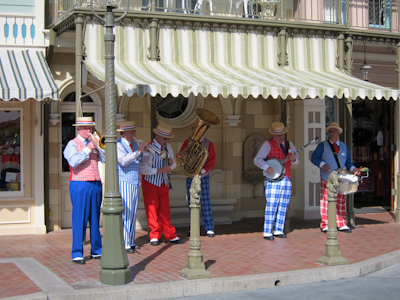 Anyway, here was this band of merry musicians. 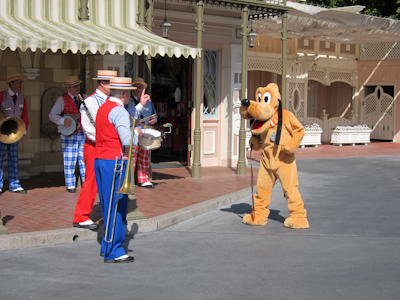 OMG, Pluto's going to eat the trombone player!!! 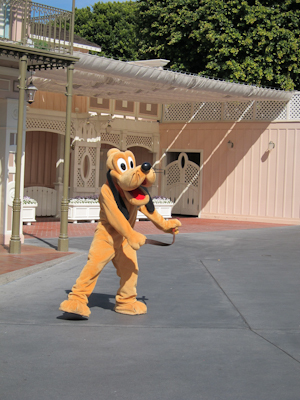 The band then played a song they identified as being about a dog, and Pluto did a dance with his leash. It was really fun, and actually quite nice to see Pluto get some alone time. He gets upstaged by that pushy Goofy all the time. And just when I thought the fun was over, guess who showed up? 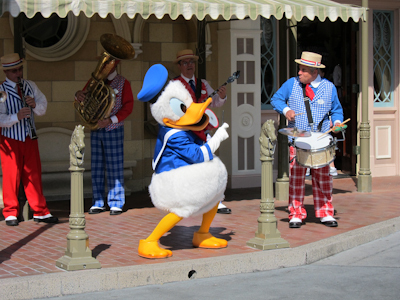 Donald came out to challenge the drummer to a drum-off. It’s like a dance-off except there’s no dancing or burning trash cans. Apparently the event was BYOD (bring your own drum). Donald won. 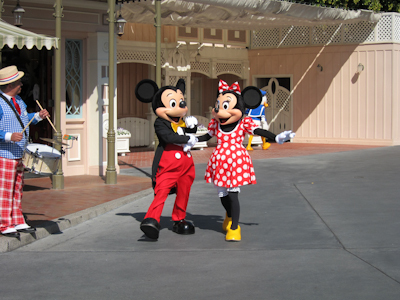 Mickey and Minnie showed up. THEY did, indeed have a dance-off. Minnie won. Don’t be taken in by those oversized tacky heels–this girl can DANCE. Immediately following that, the characters snuck off to the side to line up for autographs and pictures. I had no idea what this group was called, so I asked around on the internet and found that they are the Straw Hatters, in reference to their…wait for it, wait for it…straw hats. All in all, it was a very fun little performance. 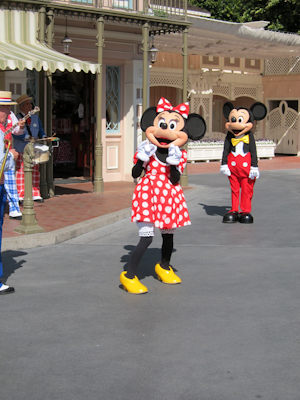 Keep your eyes open at Disneyland–you never know what you’ll see! How fun to get to watch a dance off. It is amazing the detail and trouble Disney goes through to make sure that there is entertainment and whimsy in every inch of the park.